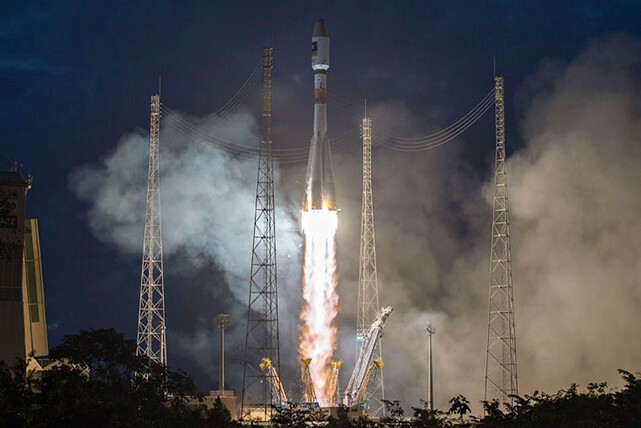 With tonight’s Soyuz success that lofted two Galileo satellites from French Guiana, Arianespace once again has delivered on its primary mission to support European governments and institutions with independent, reliable and available access to space. 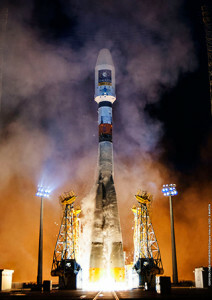 Lifting off from the Spaceport at precisely 6:46:18 p.m. local time, the medium-lift Soyuz performed a flight of nearly 3 hours and 48 minutes to deploy “Adam” and “Anastasia” – which are the third and fourth Full Operational Capability (FOC) spacecraft for Europe’s Galileo global navigation satellite system. After an initial powered phase of Soyuz’ three lower stages, the launch included two burns of the Fregat upper stage – separated by a three-hour-plus ballistic phase – to place the two 700-kg.-class satellites at their targeted deployment point. Total payload lift performance for the flight was estimated at 1,597 kg. on a mission to a circular medium-Earth orbit. Flight VS11 was the 11th Soyuz liftoff performed from French Guiana since this vehicle’s 2011 introduction at the Spaceport. Galileo’s FOC phase – during which the network’s complete operational and ground infrastructure will be deployed – is being managed and funded by the European Commission, with the European Space Agency delegated as the design and procurement agent on the Commission’s behalf. Adam and Anastasia were built by OHB System, with Surrey Satellite Technology Ltd. supplying their navigation payloads. During post-launch comments from the Spaceport, Arianespace Chairman and CEO Stéphane Israël thanked and congratulated everyone involved with the Soyuz mission – which is designated VS11 in the company’s numbering system – but added that there is still much work to be done for the Galileo program moving forward. He said there are six more Galileo launches to come following tonight’s success: three missions on Soyuz with six additional FOC satellites, and three launches on Ariane 5, with 12 more units. The on-target Soyuz launch of Adam and Anastasia followed by one day the 35th anniversary of Arianespace’s creation in 1980, and it underscores the company’s readiness to deliver a service that continues to match customers’ requirements. Flight VS11 was Arianespace’s second mission in 2015 with a member of its complete launcher family – which also includes the heavyweight Ariane 5 and light-lift Vega. It follows the Vega flight on February 11 that lofted Europe’s Intermediate eXperimental Vehicle (IXV), and puts the company on track to match its 2014 cadence with 11 total launches planned this year from the Spaceport, based on the availability of payloads scheduled for these missions.